An attendee at my retirement/art party last Saturday at The Garden Cafe in Dallas bought this painting. We all seem to have a love affair with red poppies. If you ever get a chance to sit in a field of them, take it! I had my opportunity while visiting my daughter in Jerusalem. I have 17 paintings on exhibit at the Garden Cafe in Dallas, 5310 Junius St. Have brunch or lunch there and see my paintings. The opening reception is on Friday, March 15th from 6:30 to 8:30 pm. The address is 3500 Gaston Ave, Dallas 75246. Come and see all my new work showing all the places I have been in the last year! I did a workshop with Patrick Saunders in San Antonio last weekend for painting flowers. Here are the red poppies I did. Everyone loves red poppies. The purple in the center really pops. It would be fun to paint giant red poppies. I saw this scene at the Middleton plantation outside of Charleston on the Ashley River. Before the Civil War, this was used as a rice field which was backbreaking and dangerous work. I was attracted to the cloud reflections in the water and the tiny strip of land with the distant trees. Please come to my show “What I Did on My Summer Vacation.” The opening reception is on Friday, March 15 from 6:30 to 8:30. 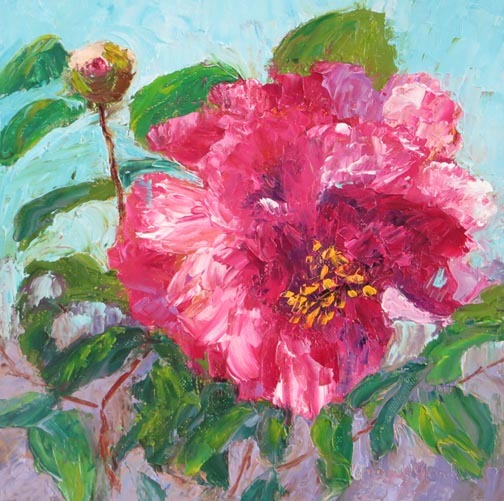 "Pink & White Camellia" by Ann McCann 8 X 8"
I am continuing with my theme of Charleston camellias. This was a pink and white one that I shot. Note the perfect bud top left. I worked on that quite a bit! When I was in Charleston over the Christmas holiday, the camellias were starting to bloom. I shot as many as I could. Here is lovely pink one that was at the air b&b where we stayed. I don’t think I have ever posted this painting. It’s one that I did over a long period of time. I kept heightening the color. These hardy prairie flowers flourish in my garden all summer and come back every year. They make me happy when I look at them. Enjoy. Rona saw the colorful self portrait that I painted and wanted one for herself. So, here she is the portrait I painted for her. She asked me to exaggerate her mouth and emphasize the green in her eyes. Enjoy Rona! I took the photo of this scene on top of a bridge with 6 inches between me and the trucks! And they were roaring by and beeping at me. But I wanted this view of the low country on plantation row outside of Charleston. 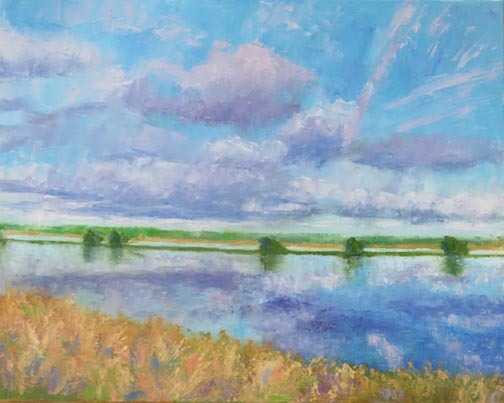 I loved painting the reflections of the marsh reeds on the water so much that I want to do a close-up next. I also saw a triptych of a similar scene that I would like to try too. Retired & Ready to Paint! As of January 3, I am retired from my professor job. I am ready to paint full-time. Here are some images from our December trip to Charleston, a city of elegant townhouses, sweeping plantations and gardens. I want to paint it all! Like Texas bluebonnets, these are lupines. However, these Jerusalem lupines are 2 1/2 ft tall, a whole field of them! See the picture below of my daughter sitting in the field.